HOW: we are currently working with Robin Banerjee and Fidelma Hanrahan from School of Psychology, a plan for evaluating the experience of ensemble performance in our target user group has been devised. Aims. This research has been designed to test whether the introduction of networked tablets will enhance the experience of ensemble music making by reducing practical problems associated with ensemble music playing for early stage musicians (e.g. getting lost in the music) thereby leading to better engagement the music. By reducing practical problems, thereby interrupting the downward spiral of frustration and lack of confidence in playing, we expect that instead of low levels of enjoyment of ensemble music playing, feelings of enjoyment and identification with the orchestra will be enhanced. Participants. 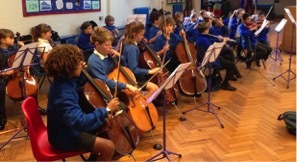 Participants taking part in the quasi-experimental test phases in this study will be the existing participants of Southover Primary School orchestra, aged 9 to 11 years – approximately 27 pupils in total. Methods. A quasi-experimental approach using survey measures at pre, during and post time points will be used to measure pupils’ experience of ensemble music playing and the impact of the introduction of technology. Questions tap into pupils’ enjoyment of, sense of belonging to, and engagement in, orchestra. In addition, an in-depth interview with the music teacher/orchestra conductor, and a focus group with a sample of young orchestra players will be run in order to capture their perspective on the experience of ensemble music playing and what difference, if any, the introduction of networked tablets has had on pupil engagement in orchestra.